Explanation: A bright spiral galaxy of the northern sky, Messier 63 is about 25 million light-years distant in the loyal constellation Canes Venatici. Also cataloged as NGC 5055, the majestic island universe is nearly 100,000 light-years across. That's about the size of our own Milky Way Galaxy. 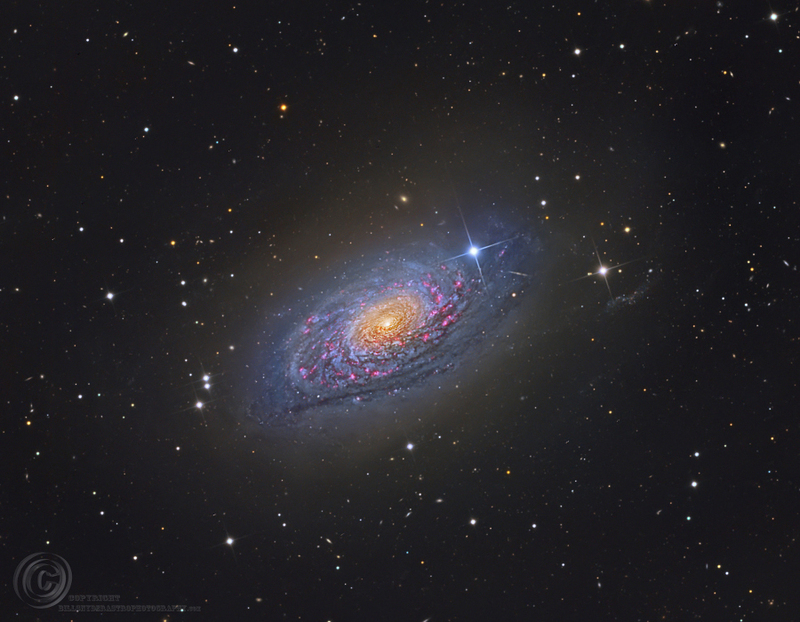 Known by the popular moniker, The Sunflower Galaxy, M63 sports a bright yellowish core in this sharp, colorful galaxy portrait. Its sweeping blue spiral arms are streaked with cosmic dust lanes and dotted with pink star forming regions. A dominant member of a known galaxy group, M63 has faint, extended features that could be the result of gravitational interactions with nearby galaxies. In fact, M63 shines across the electromagnetic spectrum and is thought to have undergone bursts of intense star formation.